I started the search for the best hearty lentil soup recipe when a friend told me she had just had a major surgery and was recovering at home. What could I bring, I asked with trepidation, knowing that she’s a meat and potatoes gal, and that’s not my specialty. But she wanted soup, so my mind turned to lentil soup, an easy and quick soup recipe that would be filling and satisfying and different from what other folks would be dropping off in containers on the doorstep. For inspiration, I consulted my advisory panel. 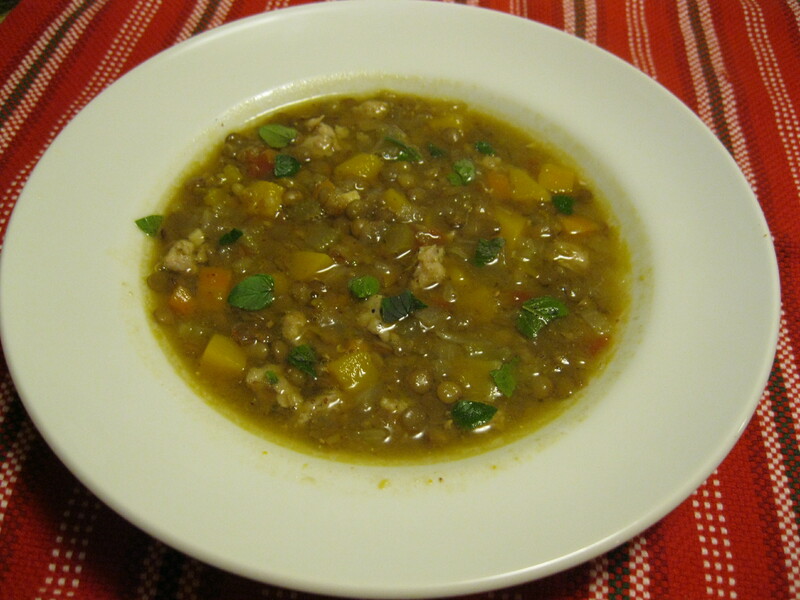 First my mom’s primer on lentils, and her lovely lentil vegetable soup. Then I found this lentil and sweet potato gem from Smitten Kitchen and this lively lentil soup recipe. Finally I went hard copy with Deborah Madison’s Vegetarian Cooking for Everyone. The end result, a hearty lentil sauage soup, was a hit with my friend, who was inundated with well wishers and their homemade goods, including soup from a besotted mechanic (she said it wasn’t as good as mine). This is a quick recipe that comes in under an hour, if you let a food processor do your chopping. 1. Cut the onion into quarters, and cut the celery into 3-inch segments and put both into a food processor with the garlic. 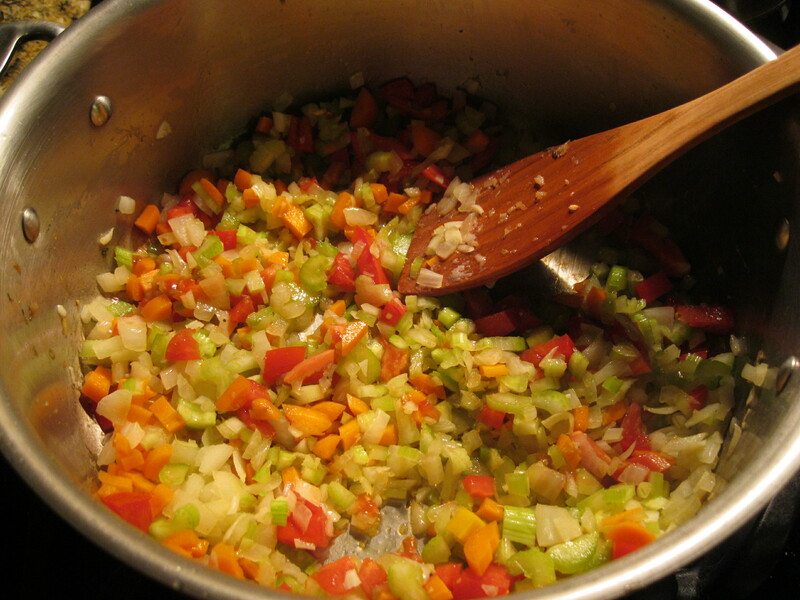 Pulse until all are finely chopped, but take care to not overprocess and puree the ingredients. If using a knife, finely chop the garlic, and cut the onions and celery into a 1/4-inch dice. Set aside. 2. In a large soup pot, heat olive oil over medium heat and put in chicken sausage–if using uncooked sausage in a casing, cut open the casing and squeeze the sausage into the pan and break it into pieces with a wooden spoon. Turn heat to medium high and stir frequently to brown sausage bits on all sides. When fully cooked and nicely browned, spoon out sausage into a bowl. 3. Add onions, celery, and garlic to the soup pot and cook until soft, about 5-7 minutes, scraping the bottom of the pot with your spoon to release bits of sausage. If there are not enough pan juices, add 1 to 2 teaspoons of oil. Stir in chopped tomato, lentils, cumin, and 9 cups of water. Bring to a simmer and simmer for 10 minutes, then add the butternut squash and cook another 15 to 20 minutes, until lentils are soft (remove a couple with a spoon, cool briefly and test them–they are cooked when you bite into them and do not get any resistance). 4. At this point, I turn off the heat and use an immersion blender for about 20 seconds to puree some of the lentil soup and make it thicker, but this is up to you. You could also remove a cup of soup, put it in the blender and then stir it back into the pot. 5. Turn heat to medium high, add sausage, 1 TBS dijon mustard, and salt and pepper to taste, and simmer for 2 minutes. 6. Serve your tasty lentil and sausage soup warm with crusty bread. Serves 4-6 as a main meal. This entry was posted in Beans and legumes, Comfort food, Healthy, Soup and tagged easy lentil soup recipe, hearty soup, lentil recipes, lentil sausage soup, lentils recipe, low-fat lentil soup by Amy. Bookmark the permalink.